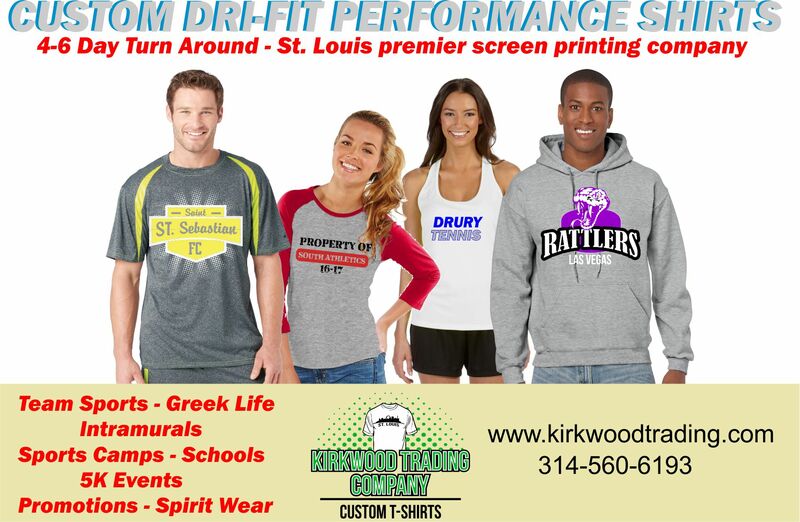 Kirkwood Trading Company St. Louis provides custom dri-fit performances tees. Custom Dri-Fit performance shirts are really a 100% polyester performance t-shirt with moisture wicking properties. The term Dri-Fit is actually a trademarked term by Nike and has become the staple term for apparel that wicks moisture away from the body keeping your cool when it’s hot out. We carry Nike Dri-Fit Golf shirts for your business casual needs but in this post we are talking about the popularity of the t-shirt which we will refer to as a performance t-shirt. Different companies have their own term for a performance t-shirt. You have Dryblend, Stay Dry, Cool Dry to name a few. What do all of these have in common with the custom dri-fit performance shirts? They are all either 100% polyester or a blend that includes polyester. For a true performance t-shirt where sweat gets wisked away and evaporates the more poly in the garment the better job the wicking performs. The current trend on custom t-shirt screen printing is performance apparel. It’s lightweight and it’s soft and it performs. Peformance apparel is comfortable to wear for all occasions. Whether it’s intramural sports, team jerseys, promotional shirts for a 5K run, or simply a style you offer in your schools spirit wear. The performance poly shirts are big sellers and a big hit with consumers. When the performance shirts hit the screen printing market in mass about 8 years ago they were expensive and for our company, Kirkwood Trading Company, they made up less than 5% of the apparel we printed for customers. Fast forward to 2016 and custom dri-fit performance shirts make up around 35% and climbing. The ever popular 100% preshrunk cotton shirts still make up the bulk because at the end of the day they are the least expensive shirt, have mass appeal, come in hundreds of colors, and are cost effective for most custom t-shirt needs. Shirts that don’t fall into the cotton or performance category are some sort of blend containing ringspun soft cotton and polyester where you get the light weight and usually more tapered shirt. Kirkwood Trading Company has been screen printing custom t-shirts for over 20 years in Kirkwood, Missouri. We can educate our clients and help you decide whhich is the right shirt for your custom t-shirt needs. We are a small family owned business where you can actually talk to a live person who answers the phone. Give us a call for your next custom t-shirt need here in St. Louis and we’ll be happy to provide you with a free price quote.